Alrighty Monday, we are ready for ya! Good morning! A special happy birthday to my grandma today! She is 94! Wow! I have some ritual when I get up in the morning. I think we all do. My morning ritual definitely includes coffee and sitting down to my computer to see what is up for the day. During Advent and Lent, I get to think about where scripture is leading me to write. Other days I like to see what scripture is ruminating with me. I look over my schedule. I scroll through facebook. Write happy birthday on timelines. I scroll through emails and de clutter. I sip more coffee, grab a bit of breakfast. Monday mornings are a little sleepier for me. Sundays are usually pretty full so it takes me just a little bit longer to really get going. I purposefully don’t schedule meetings on Monday mornings if I can help it to give a little cushion into the week. I go to the office and check in with staff, talk about finances, say hey to people coming in for coffee. I intentionally hang out in the office Monday morning because it seems to be when people are needing to see the office staff. We have been thinking all weekend about that one thing we need to get done. There may be some variation on that. It may be “God, what do we have in store for today?” or “Ok God, we have things to do.” or “How about you carry this one today? I am tired.” or “Ok, God I am ready for whatever today brings!” Whatever it is, I wake up talking with God about how we are in this together. 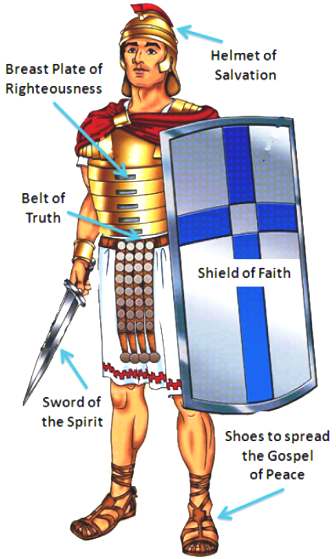 When I read today’s scripture about putting on the armor, all of it, this is what it makes me think of. I don’t have the same sense of armor that the people in Ephesus could relate to but Paul is taking war imagery and making it personal and rethinking the purpose. Instead of marching into war, we are marching for peace. Instead of protecting against an enemy we are protecting against things that might keep us from God. I love that Paul writes that our enemy is now consumerism and authority that is not God…not people. By starting my day with a little chat with God, I am putting on what it means to be a disciple and me. I am not putting on an act but I don’t I can’t do this world alone. God beside me is how I get through day to day. The people around me are the way we create change.